Stock photo of a statue monument commemorating the Airmen of World War II situated outside the Legislative Building in the City of Winnipeg, Manitoba, Canada. A stock photo showing a bronze statue of an Airman wearing flight clothing and cap of the 1930's and 1940's. This Airman is looking up and has an arm and hand raised in front of him as though shielding his eyes from the sun. Leaning up against his left foot is his back pack and he's carrying a clipboard in his right hand. The statue which is mounted on a stone platform is named "First Flight" and is dedicated to all the airmen trainees and instructors who lost their lives while training in Canada. 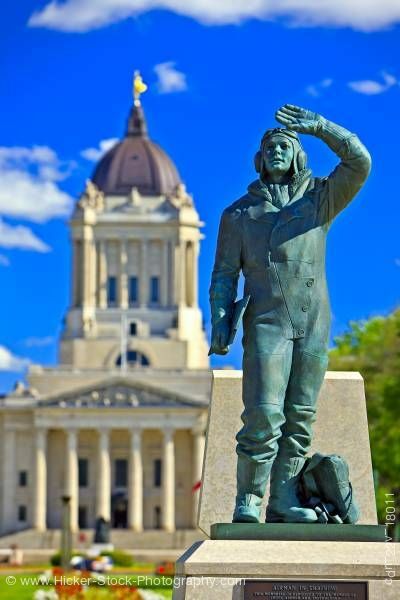 Behind this airman statue is the majestic Manitoba Legislative Building which was completed in 1919 in a Neo-Classical style of architecture. The main entrance of the building features a row of 6 columns and behind the entrance are the straight exterior walls of the antechamber with the dome rotunda on top. Statue of an Airman (a monument for the Airmen that lost their lives during World War II) and the Legislative Building, City of Winnipeg, Manitoba, Canada.